A wonderfully relaxed laid back evening of music - something for everyone. Join in the singing if you wish- if you know the words. Bring your own refreshments and there will be a raffle as well. Bring all that loose change lying around the house in drawers or little pots. All money will go to Upendo Junior School, Kiminini, Kenya to help purchase a huge water tank that will not only be used by the children and staff at the school but by the local community as well. Everyone is a winner! Maxium of 40 seats. Tickets go quickly. Any and all donations are most welcomed even if you can't make the event. 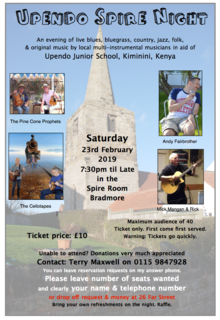 Contact: Terry Maxwell - 26 Far Street, Bradmore or on 0115 9847928 to purchase tickets.